Some of the most compelling works of fiction rely heavily on reality (Jurassic Park, anyone?) 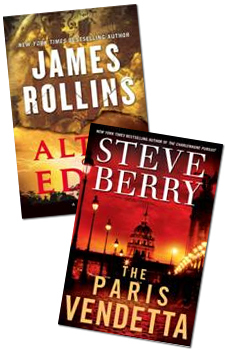 New York Times best-selling authors James Rollins and Steve Berry are masters of weaving fact into fiction – and both will be at HMNS on Tuesday, Jan. 19 for An Evening of Thrills: How Science and History Make Great Thrillers. They’ll each be signing their latest releases after the lecture; tickets are going fast – get yours here. Last week, Rollins gave us a sneak peak in his own guest blog; this week Berry talks about the upcoming lecture. Fiction into reality? That’s a little backwards for me. What I do is turn reality into fiction. I like to find something from the past—the Amber Room, the lost Romanov children, Charlemagne, the tomb of Alexander the Great—items or artifacts you may not know much about (but, hopefully, would enjoy exploring), then weave a modern day tale around them. The kind of stories I’ve always like to read have a mix of secrets, conspiracies, history, action, adventure and international settings. So it was only natural that I would write that same kind of story. Every novel for me starts as a treasure hunt. I’m searching for bits of reality that somehow can be woven together into a coherent plot. In fact, the challenge is to find the most unrelated stuff as possible, then relate them through a twist of the facts. While doing this, I have to always keep in mind that I’m not writing a textbook, it’s a novel, whose primary job is to entertain. But that doesn’t mean the reader can’t learn some stuff along the way. I enjoy that aspect, and I’ve come to learn that my readers do too. I’m careful, though, with my twisting, and I make sure the reader knows where I played with the facts by including a writer’s note at the end of each of my books. In Houston, on January 19th, Jim Rollins and I will be discussing all of this. Jim’s books are a little history and lot of science, mine are the other way around. But we both definitely like to tinker with reality. For me, every book involves around 200 -300 sources obtained from many trips to bookstores; lots of internet browsing; and at least one visit to a locale important to the book. I have, for days, sat in a German Cathedral (The Charlemagne Pursuit); roamed an abbey in Portugal (The Alexandria Link); scoured Paris (The Paris Vendetta); climbed citadels in southern France (The Templar Legacy); boated all over Venice (The Venetian Betrayal); and wandered through the Kremlin (The Romanov Prophecy). So drop by January 19th to the museum at 6:30 and spend an evening with me and Jim Rollins. Have your questions ready. See you then. An Evening of Thrills: How Science and History Make Great Thrillers will take place on Tuesday, Jan. 19 at 6:30 pm. Both authors will sign copies of their latest works after the lecture; copies will be available for purchase from Murder by the Book. Tickets are available here. The lecture was great! Entertaining, funny, informative! Totally enjoyed it! Thanks for coming to Houston!